When I Was Seventeen, I Learned About Giacometti From My Art Teacher and Became Drawn to Sculpture—and So I Make Sculptures Now. ©2016 Otani Workshop/Kaikai Kiki Co., Ltd. All Rights Reserved. From Saturday November 26 to Saturday December 24, 2016, Kaikai Kiki Gallery will present When I Was Seventeen, I Learned About Giacometti From My Art Teacher and Became Drawn to Sculpture—and So I Make Sculptures Now., a solo exhibition by Otani Workshop. I was always drawn to art since I was little, and joined the art club in my high school. The teacher of the club introduced me to many things, from Giacometti to old paintings, and that made me sincerely want to become an artist. To achieve that goal, I thought, I would have to get into an art school, so I went to Tokyo and took some summer classes at a preparatory school. This turned out to be a confusing experience for me. I could not understand what on earth an exercise like “composing an imaginary scene that involves a potato” had to do with art. It felt like a riddle to me, and I thought, “Well, if this is something that would lead me to today’s art, I don’t want it.” As I was more interested in training my eyes and hands, I enrolled in the sculpture course at an art school in Okinawa. There, an upperclassman told me that there couldn’t be anyone in Japan who made his or her living solely by making sculptures. Once again, I became confused: If I couldn’t make a living as a sculptor, what was the point of staying in college? I decided to take a one-year leave of absence from school to see the world. I hope this exhibition will embody this feeling I had on the road back then. We are pleased to present an exhibition of works by an artist who goes by the professional name of Otani Workshop. 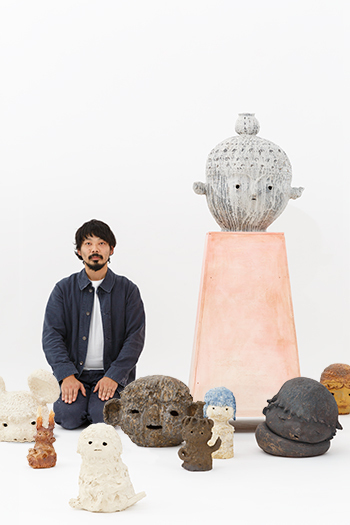 Toward the end of each year, generally speaking, we hold an exhibition of works by Japanese ceramicists, but this year, our show is not quite business as usual. Otani Workshop, as his name suggests, is an artist who does crafts. He does make ceramics as well, but his true profession is in crafting. When you hear “workshop” and “craft,” you might think of something innocent, like children working on art projects. If I remember correctly, I first met Otani at Tri Gallery Ochanomizu in Tokyo. I continued to follow his shows at other galleries and, for the past four years or so, have been showing his works at my gallery as well. One of the details from our early conversations that left a particular impression on me was the fact that he used to assist Yoshitomo Nara with the production of his ceramic works. It’s true that Otani’s works have something in common with Nara’s. In a sense, they both have artistic themes once removed from the conservative, mainstream themes of western art. Perhaps they are not unlike Gauguin or Henri Rousseau; it is as though they create in order to answer the question existing at the core of art, that is, why we create and appreciate art in the first place. In the past few years, however, Otani Workshop has started to push Shigeru Otani (his real name) the ceramicist to the foreground, and I have repeatedly been asking him whether that is really how it should be. Likewise, when I first saw his installation plan for this show, the presentation seemed to scream, “Please see my ceramic works!” So I got serious and pressed him on this matter. “Why don’t you retire your artist name, Otani Workshop, and start working as ceramicist Shigeru Otani? It’s like (the Japanese television celebrity) Tamori going back to being Kazuyoshi Morita to do more serious work after becoming popular, so if you want to be Shigeru Otani, be my guest. But I, for one, don’t like this lukewarm attitude of yours, this lack of responsibility toward your artist name. Following our conversation, Otani came back to me with a new installation plan, emphatically declaring that he will live out his life under the artist name Otani Workshop. So I looked at the new plan and… Well, it certainly didn’t look like a show of a ceramicist, what with its cheerful feel. I responded with a question, however: Would this really works, as it feels a bit superficial? To this, Otani responded: “When I contemplated my work in relation to the artist name, I wondered what the most essential thing might be to me, and something my high school sculpture teacher had told me came to my mind. The work that supposedly looks similar to Nara’s is the one I created while thinking about what he said, what seemed crucial to me now. I thought this was a really good reaction. So the title of his show has been decided: When I Was Seventeen, I Learned About Giacometti From My Art Teacher and Became Drawn to Sculpture—and So I Make Sculptures Now. Treading the boundary of ceramics, sculpture, and craft, he may look like an ambiguous amateur, but to stake out and maintain his place on that boundary requires a certain mental preparation on his part. I believe his determination comes through this show. I hope you will enjoy—I am myself very much looking forward to it.